Dan and I wanted to thank you so much for making the best of our lives so very special! From the first time we met you in November 2015 you made us feel at ease and quickly became part of the family. You made the daunting process of getting married abroad seem easy – I think a lot easier than getting married in the UK would’ve been. I have no doubt this was due to your experience and professionalism, you gave us the opportunity to have the wedding of our dreams and enjoy the lead up without a worry (no bridezilla moments for me!). We were naturally concerned about the legalities of getting married out of the UK, however you had all our meetings organised and ensured the town hall and court house were as quick as possible so we could get back to our holiday – even providing us with transport in the form of Stella’s Taxis :-). On the day, you and Sherie were an A class team!! Everything was better than I imagined it could be!! There is not one thing I could fault. Sherie decorated and laid the tables without any guidance from me and it was absolutely perfect job. It was as if she could see it into my mind. The suppliers that you recommended were amazing like you and very approachable and professional. From the make up artist, hairdressers, Jackie at Love Island Cakes, the photographer – Andrzej, Andrew and Finola at Limelight Films, Dan the DJ to Tara at Coral Beach Hotel – you all came together and made the perfect team. One of the most amazing things of the day was your ability to fit EVERYTHING into that little bag of yours!!! When my eyeliner ran, you fixed it, when my curls loosened, you were there to re pin and re spray – you were there whenever we needed you. Without you, the day would not have been what it was – we would recommend Stella Virdi’s services to anyone!! 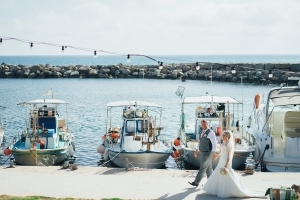 Stella you really are the BEST wedding planner in Paphos. I look forward to seeing you again at some point….